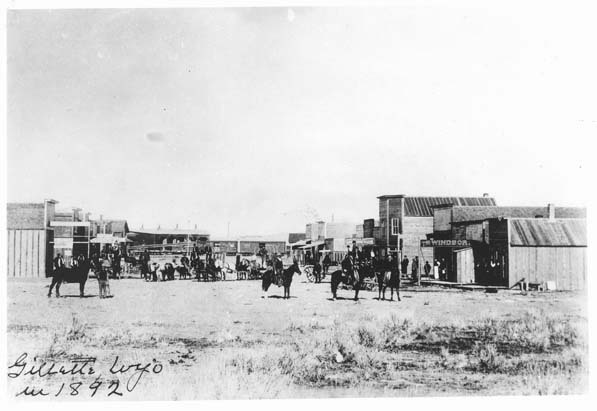 On This Day in Wyoming History… 1892: What Invasion? This week marks the 125th anniversary of the Johnson County War or Johnson County Invasion, depending upon you’re view. Much has been written in the last century about the events of April 1892 and the debate rages to this day about what did or did not happen in Northern Wyoming. This is the story of an erstwhile traveler who was caught up in the excitement, as told by Albert W. Richards of Sheridan in the 1930s. In the Spring of 1892, I, in the company of other young men, made a trip into Kansas City where we heard that the new railroad extension of the CB&Q which ran from Kansas City, Missouri, to Gillette, Wyoming, was offering to take anyone into the new territory for the nominal price of $2. 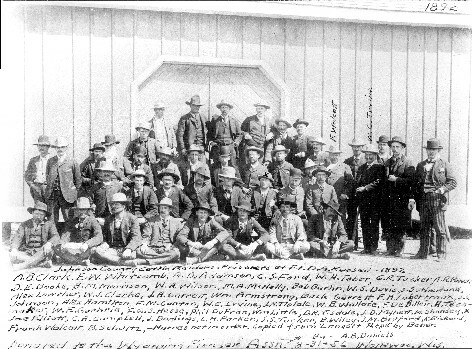 Johnson County Invaders being held by the US Army at Fort DA Russell in 1892. Gillette at that time was the end of the railroad and it was certainly a busy little town but of course the excitement that prevailed was the outgrowth of the Cattlemen’s Invasion which had taken place a few days previously and the cattlemen were then being held prisoners at Ft. McKinney and everyone was excited, suspicious and nervous. But Gillette was a typical little railroad burg at that time: there were a few dwellings and only about half a hundred business houses which were for the most part saloons or combinations of saloons and restaurants. But what Gillette lacked in buildings, it made up for in crowds – everywhere, on the street corners, in saloons, restaurants, everywhere there were large groups of freighters, cowboys, farm hands, emigrants and Indians. They were a heterogeneous mob but they were all good fellows and a spirit of good fellowship prevailed that you find nowhere today. Richards and his partner found a ride to Sheridan with a freight outfit for $5 each. Three weeks later, we reached Sheridan. It had been a terrible trip. Rain and snow and soft roads all the way up. As soon as I landed in Sheridan, I secured a job with [James M.] Works, father of Clara Works and Mrs. Jack Flagg. 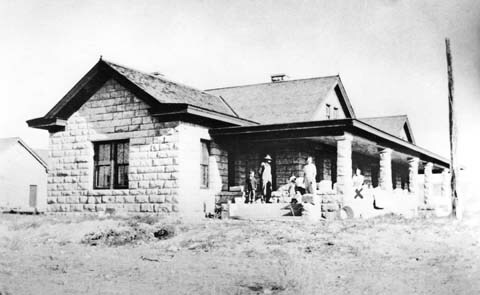 Clara was the first teacher to teach in Sheridan… in 1882-83… Mrs. Jack Flagg was married to a rustler of Johnson County and Works was all riled up over the invasion and I began to believe that this was a wild and woolly West sure enough. I didn’t know anything about the controversy between the rustlers and the cattlemen and told Works so, so he fired me. I laugh about it now when I think about it all. I guess Works thought I was in sympathy with the cattlemen and he was all wrought up about it. 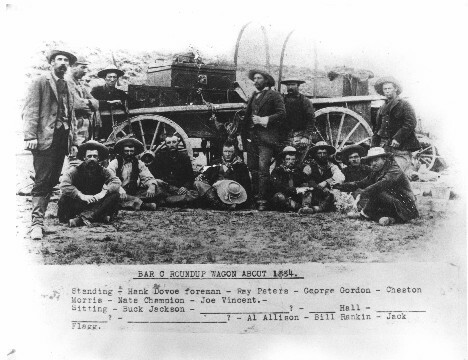 Cowboys around the Bar C Roundup Wagon, ca 1884. Several of the men in this group would be involved in the 1892 range war, including Nate Champion and Jack Flagg. 1. WPA Bio 2208, A.W. 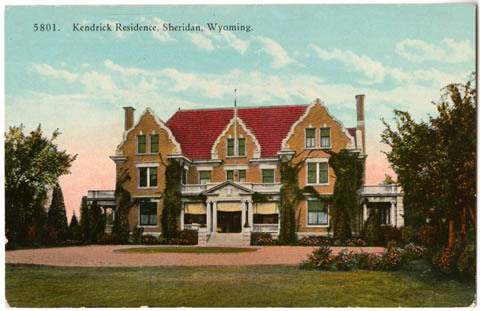 Richards, Wyoming State Archives. Punctuation corrected. 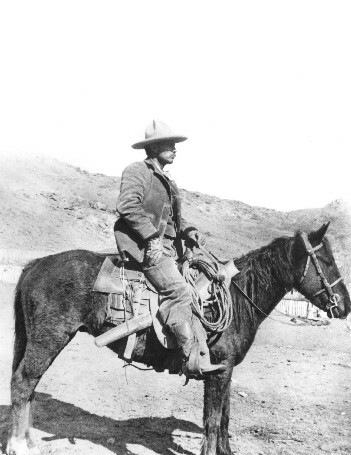 Richards settled in Sheridan County, working as a mail carrier, milk man, ranch hand, gold miner, and farmer, among other things. Gage, Jack R. The Johnson County War. Cheyenne, Wyo. : Flintlock Pub. Co., 1969. Mercer, A S. The Banditti of the Plains. Norman: University of Oklahoma Press, 1954. Print.